Here, we list every event of interest to the Canadian furniture, mattress and major appliance industry for the coming year and often beyond. Held annually by the Canadian Home Furnishings Alliance, the gala celebrates the Retailer of the Year and the recipient of the association's Lifetime Achievement Award. This year, the gala will be held at the Universal Event Space in Toronto. For more information, contact CHFA president Murray Vaughn at (905) 678-4678. Owned and operated by the Quebec Furniture Manufacturers Assn., the is the only national trade event held annually for the Canadian furniture and mattress industry. Featured are some 200+ manufacturers, distributors and other resources offering everything from upholstery, case goods, mattresses and major appliances to decorative accessories and retail services. It is held at the International Centre in Toronto. Organised by the Retail Council of Canada, STORE is a two-day conference held annually at the Toronto Congress Centre and features an extensive agenda as well as networking opportunities targeted to the unique needs of this country's dynamic retail industry. The agenda will include main stage keynotes and interactive panels to drive big ideas and concurrent sessions to strengthen all retail businesses. Organised by the International Textile Marketing Association, and held twice a year, this event is dedicated to the introduction of the latest textiles and leathers from fabric mills and tanneries with showrooms in High Point, North Carolina. Held at the AmericasMart complex here, this week-long trade event hosts more than 9,000 brands across a broad number of categories including home décor, furniture, and rugs, along with accessories, gift and more. 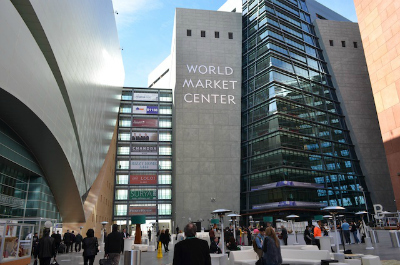 Held at the World Market Center in Las Vegas, this has become one of the most important furniture, mattress, home furnishings and giftware trade events in North America. It is owned and organised by International Market Centers. Organised by Cantrex Nationwide and its parent company, Nationwide Marketing Group, this semi-annual conference and trade event is held for their 3,000 or independent furniture, mattress and major appliance retail members. This four-day event will be held in Las Vegas. Organised by the Canadian Gift Association and held at both the International Centre and the Toronto Congress Centre in Mississauga, Ontario, this event serves a wide range of retail buyers from the owners of gift shops to home furnishings and decor specialists. Originally designed as a market for promotional furniture, this trade event features some 600 exhibitors from both the U.S. and abroad covering some 1.6 million square feet of exhibit space. Organised by the Canadian Giftware Association, this cousin to the Toronto Gift Fair is held at the Edmonton Expo Centre in Edmonton, Alberta. Held annually by the Montreal-based Cantex Nationwide, this is a combination conference and buying fair for all of its members, regardless of their particular product category. The categories covered include: furniture, mattresses, major appliances, floor covering and photography. This event will be held at the Centre des Congres in Quebec City. Held at the Vancouver Convention Centre West, this is the West Coast counterpart to the Interior Design Show in Toronto, and attracts 7,300 interior designers, architects and other industry professionals as well as some 23,000 consumers. Held at the Merchandise Mart in Chicago, this trade event focuses on furniture, trends and accessories for outdoor living across a number of product categories. Its endorsed by the International Casual Furnishings Association (ICFA). Organised by the High Point Market Authority, this trade-only and semi-annual furniture and furnishings events is reputedly the world's largest with more than 2,000 exhibitors displaying goods and services across some 180 buildings and over 10 million square feet of space. It hosts some 75,000 trade professionals each April and October. Organised by the International Textile Alliance (ITA) and held in High Point, North Carolina, this trade event puts the spotlight on fabrics and other textiles used in furniture making. Formerly called the International Consumer Electronics Show, CES showcases more than 3,900 exhibiting companies, including manufacturers, developers and suppliers of consumer technology hardware, content, technology delivery systems and more; a conference program with more than 300 conference sessions and more than 170K attendees from 150 countries. Organised by the Interior Designers of Canada, this annual trade show and conference features a broad range of goods and services for interior designers, architects and facility managers including furniture, floor coverings, lighting, accessories and more. Now part of the Interior Design Show (IDS), it is held at the Metro Toronto Convention Centre. The International Surface Event (TISE) is the largest North American event serving the floor covering, stone and tile industries. It is comprised of the SURFACES, StonExpo/Marmomacc Americas and Tile Expo. Owned and organised by UBM, the Malaysian International Furniture Fair (MIFF) is one of the largest furniture industry trade events in Asia and is held at the Putra World Trade Centre in Kuala Lumpur. In 2017, it hosted some 18,000 attendees from 130 regions and countries around the world. Held once every two years and organised by the International Sleep Products Association, which describes this event as "The Forum for Mattress Industry Executives and Management". It will be held at the Vinoy Renaissance Resort & Golf Club in St. Petersburg, Florida. Reputedly the world's largest trade event for furniture and furnishings with some 2,000+ exhibitors spread out over some 180 building and approximately 10 million square feet of display space. Total attendance is estimated at 70,000+ each market. Held in High Point, North Carolina twice a year, in April and October.